The Turtle Beach Ear Force XRAY XP400 wireless headset not only impresses with its sound, but is also a convenient control center that allows gamers to control and enjoy multiple audio sources. 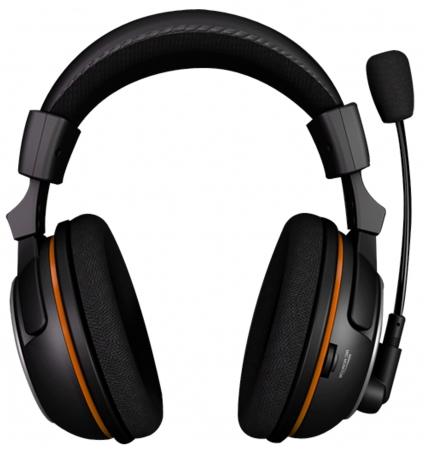 The PS3 and Xbox 360 compatible Bluetooth headset is a limited special edition for the successful shooter Call of Duty: Black Ops II, which is also reflected in the design. Das Headset Turtle Beach Ear Force XRAY XP400 ist aber nicht nur für das Gaming geeignet. Weil die verbaute Bluetooth-Technologie Dual-Pairing bietet, lassen sich selbst während des Zockens mit einem Knopfdruck auch Anrufe annehmen und bequem führen. Die verbauten Akkus ermöglichen bis zu zehn Stunden Spielspaß, bis sie wieder aufgeladen werden müssen. Wer dann immer noch nicht genug hat, kann die Akkus sogar während des Spielens aufladen. For a gaming-specialized headset such as the Turtle Beach Ear Force XRAY XP400, the sound must be convincing. This succeeds without any compromises. When gambling, the sources of noise can be located perfectly, which is very close to a K.O. criterion for shooters in general and "Call of Duty: Black Ops II" in particular. Thanks to dual-band WLAN on the 2.4 and 5 GHz frequencies, the audio transmission is not disturbed by other wireless networks. The volume level for chats and games can be controlled independently of each other. Thanks to Dolby Digital 5.1 surround sound and 50mm speakers, the wireless headset also makes music and movies enjoyable. Various sound settings - for example, the exact position of the "virtual speakers" - can be individually adjusted. Das Headset ist in verschiedene Größen einstellbar. Normalerweise ist er für jeden Kopf geeignet, jedoch ist von einer Verwendung bei Kleinkindern abzusehen.